a length of wire 針金 1 本.
a piece of wire 針金 1 本; 針金の破片. send (a person) congratulations by wire (人に)祝電を打つ. send (a person) a wire＝send a wire (to a person) (人に)電報を打つ. wire a house (for electricity) 家に電線を架設する. wire a birthday greeting 誕生日の祝電を打つ. I wired him to come back at once. 彼にすぐ戻れと電報を打った. She wired (him) that she was coming soon. 彼女は(彼に)すぐ行くと電報を打った. He wired me the result.＝He wired the result to me. その結果を電報で知らせてくれた. Please wire as soon as you hear. お耳に入り次第電報をください. wire home for money 金送れと家に電報を打つ. He tied a basket to the bicycle with wire. The electric wires were broken by the typhoon. They haven't wired the new house yet. He wired several logs together. I wired my parents in the country. He wired us the result of the test. He wired his daughter to come home at once. My son wired me that he had passed. He wired to his mother for money. The box was fastened with a rusty wire. 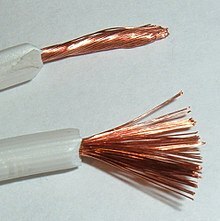 ・Copper wire conducts electricity very well. 銅線は電気をとてもよく通す. From Middle English wir, wyr, from 古期英語 wīr (“wire, metal thread, wire-ornament”), from Proto-Germanic *wīraz (“wire”), from Proto-Indo-European *weh₁iros (“a twist, thread, cord, wire”), from *weh₁y- (“to turn, twist, weave, plait”). (archaic, thieves' スラング) A pickpocket who targets women.